No history of the folding pocket knife is complete without the Buck 110 Folding Hunter. It is arguably the first modern folder, in ethos if not in design. “Buck knife” is now a catch-all term for a certain style of blade, and the 110 is responsible for that. More than other knife besides the Swiss Army Knife, the Buck 110 is an icon. But for all that it heralds modern folder design, the 110 is more antithetical to a Paramilitary 2 or a Griptilian than a traditional knife. It’s a question of refinement. Traditionals evolved on a separate path, and even if that evolution peaked 100 years ago there is a lot more refinement in a Case Peanut than in the 110. Its design is iconic and influential, but it does seem crude by modern standards. Is it fair to hold the 110 to modern standards? Well, Buck still markets this knife as a tool, not a collectible. The implication here is that they believe it is a competitive offering in today’s knife market. And crude doesn’t necessarily equate to bad. So I’ve tested it as I would any other knife under review, and after several weeks of dedicated carry and use, I have come to my conclusions regarding the 110. The 110 has a handle length of 4 ¾”, a blade length of 3 ¾”, and an overall length of 8 9/16”. It weighs 7.2 oz. The lines of the 110 are so familiar that I hardly need to go over them. The gleaming brass bolsters and wooden scales have been copied by dozens and dozens of manufacturers over the years. Although I take issue with Buck’s decision to keep the 110 design more or less as is for 50 years, I can certainly sympathize with it. Buck struck a chord with the 110. There are major issues with the tolerances, but the finish on the 110 is quite good for a $40 knife. This is a handsome blade. And beyond looks the 110 has plenty of merit, mainly thanks to its utter simplicity. I’ve talked about handles being task neutral before, but here we have a task neutral knife. Although called a hunter, there’s just an alchemy between the lines and proportions of the 110 that make it able to perform any kind of cutting task. Some of that versatility is delivered by the blade shape. A low-slung, sharkish clip point, it leverages its length to great effect. The larger blade means that you have a decent run of straight edge before the sweep to the tip, so sawing and slicing are on the table. In relation to the handle, the belly is angled so that you can really push down and get through material quickly. The tip is acute for effective leading and good piercing. And, unlike many large blades, it is a great slicer. A workhorse blade shape that manages to retain its grace as well. The steel is 420HC. Much is made of Buck’s Paul Bos heat treatments. I have no experience with this steel outside of Buck knives so I can’t say whether it makes a difference. The Buck/Bos 420HC is probably a smidge better than 8Cr13MoV, but not quite as good as AUS-8A. It dulls rather quickly, but you can sharpen the hell out of this 420HC very easily. Some steels, like VG-10, I can work and work and work on without getting past a certain level of sharpness. Here, 420HC got super sharp super quick, which I appreciate. I have no complaints about the 110’s handle shape. The bow shape handle is as neutral as it gets. A lot of makers seem to think that we need finger grooves and scallops and jimping to show us the different ways we can hold our knife, but it is always better when the handle lets us decide. There isn’t a wrong way to hold the 110. I find balance to be an essential part of good knife design. The closer the balance is to the pivot, the more control we have over the blade. The 110’s Dymondwod and brass construction lead to a rather Rubenesque knife. Balance is right in the middle of the handle, where the swell is most pronounced – a decent distance from the pivot. There’s nothing unpleasant about this while holding the knife, but in use it means you lose so much control for finer work. A shame, considering the surprising competency of this nearly 4” in delicate tasks. The 110’s two-handed opening is a bummer. Nail nicks are part of the charm of traditional knives, but the 110 isn’t a traditional knife. That’s why it’s famous. On the other hand I understand that thumb studs weren’t a common sight when the 110 came out, so I’m not faulting Buck for releasing the 110 without them, I just wish that they would have added them at some point in the last 50 years. Complaints aside, the nail nick on the 110 works well, as does simply pinching the blade as I normally do on my Opinel. The opening action is smooth and positive, and the sound when the lock engages is satisfying, and all of this was how the knife was out of the box. You expect these things to feel right on a classic, and they do. Much less right is the lock. I have faith in its safety, but it’s sloppy. From day one there was play in every direction on my 110, and the lock bar flexes quite readily during hard downward cuts. If I don’t sound particularly disappointed it’s probably because it’s the level of QC I’ve come to expect from Buck – which is itself the worst kind of condemnation. If Buck is going to continue to espouse the virtues of stateside production, I really would like to see them recognize the level of competition out there and up their game. Newer products like the Marksman seem to indicate they’re capable of tight tolerances and complicated designs, and I for one would willingly pay more to see that same attention to detail on their flagship product. There is no unqualified recommendation I can make for the 110 other than collectability. If you’re interested in knives and the history of their design, the 110 is 100% required reading. But as a tool, in any application, I can suggest a dozen other knives that outperform it. I can suggest better cutters, better locks, better fit and finish, all at or around the same price and all considerably lighter. Buck is a company with a proud history, and the 110 is central to that history. I think they’ve convinced themselves that, by changing the 110, they are flouting the tradition it represents. That’s simply not true. Spyderco has been tweaking their flagships for years and nobody’s forgotten the significance of the Delica. There is a difference between honoring your past and being imprisoned by it. It’s frustrating that there aren’t readily available modern variations on the 110 from Buck. A model with G-10 scales, aluminum bolsters, and a clip would be cool. 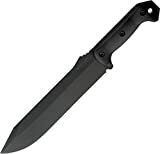 KA-BAR recently released such a knife and it is 2 oz. lighter than the 110. I don’t even know that it’s a particularly good value at $40. The finish is good in a rough and tumble, barroom countertop kind of way, but the tolerances are way below par. I think that Buck is still trying to work out its priorities and in the meantime customers are left in the lurch with some very shoddy production. The Mini Spitfire I handled was worse than this, but not much worse. The iconic character of the 110 saves it from being a total pass. This is real knife history that can be had for $40. Go grab one and see how far we’ve come. You’ll learn a lot, but don’t expect to end up using it much. It’s hard not to like the 110, but it is even harder to want to carry it. If you are considering buying a Buck 110, I recommend purchasing it at Amazon or BladeHQ. By purchasing things through any of the links on this website you support BladeReviews.com, keep the website free of annoying banner ads, and help produce future reviews. Thank you very much. Knife, Fighting Utility. That’s what the U.S. Marine Corps lists as the knife they adopted for issue in 1942 when soldiers demanded a replacement that would hold up to the rigors of more than just battle. The previous version was an excellent fighting knife, but wasn’t good for much else. Soldiers began carrying civilian models until the official versions caught up to their standard of use. The Fighting/Utility knife, sometimes called the “USMC KA-BAR”, has been in place ever since 1942 for the U.S. Marine Corps, and has also been issued to U.S. Navy and U.S. Army soldiers. While some thought that a multi-use knife would not be ideal for fighting, soldiers reported differently when returning from combat over the years from WWII and Vietnam through Afghanistan and Iraq. It’s hard to argue with that kind of deployment longevity and I have a soft spot for military issued equipment that comes as a result of listening to the troops in the field. The story behind the KA-BAR name is also hard to ignore. A fur trapper sent the owner of Union Cutlery a letter where he detailed using one of their knives to kill a wounded bear when his rifled jammed. The letter was not completely legible and “k a b ar” were the only letters they could make out from the phrase “kill a bear”. The bear story and their adoption of the name as a result is now printed and sent along with knives from the factory. KA-BAR is now also proudly stamped on one side of the blade right over Olean, N.Y. opposite whatever branch you choose to support. I hope to never have to take down a bear, but I’ve used mine for virtually every camping task and it has performed exceptionally well. Dead branches still hanging in the forest can take a toll on an edge. I’ve been pleasantly surprised with the durability of my knife after using it to clean up older trees and to gather dry timber for firewood. The standard (or “full size”) version of the Fighting/Utility Knife has an overall length of 11.875 inches, a 7-inch blade, and weighs 11.2 ounces. The Fighting/Utility knife is made in the USA. KA-BAR makes a shorter version with a 5.25-inch blade that I also picked up thinking it would be perfect for me. Unfortunately, the shorter blade option is coupled with a smaller handle, and I actually prefer the full-sized knife due to its larger and more comfortable handle. The black coated, flat ground blade comes to a bowie style clip point and is made out of 1095 Cro-Van steel. The chromium and vanadium add both resistance to elements and edge retention over plain 1095. Plain and serrated edges are available based on your preference. Edge retention and ease of sharpening usually have an inverse relationship, but they’ve done a nice job of walking that tightrope here. 1095 Cro-Van takes slightly more effort to sharpen over regular 1095, but is worth that tradeoff for an edge you can count on in the wild. There is also a 2.5 inch fuller built into the spine side of the blade to keep weight down to what feels lighter than 11.2 ounces. Blade thickness comes in at a perfect .17 inches for the intended use. It’s strong enough to baton firewood, open ammo cans and cut wire without adding weight to a soldier that needs to be mobile to stay alive. Originally the swedge of the blade was shipped out sharpened from the factory, but double edged knives are frowned upon in some states and that practice was eventually put to a halt. The full tang of the knife is visible as it protrudes through the pommel where it is securely pinned into place with a stainless steel pin you can see from one side. The pommel itself is steel and appears ready and able to withstand a reasonable pounding. On the blade end of the handle a slightly curved crossguard lightly protects the hand from danger. It doesn’t cover my full knuckle, but it does offer the end user some protection. Plus making it larger would have been a nightmare in the sheath. You have options for the handle that rests between the pommel and crossguard. The oval shape of the handle is 1 inch by 1.25 inches in circumference and tapers slightly at top and bottom so the meat of your grip is full. While leather washers are the traditional material, and I personally think make the knife “pop”, another option is the version in grippy Kraton. Kraton is far superior in regards to both resisting the elements and staying in your hand. The leather is purely beauty over function for me, but it will weather over time and that in combination with oils from your hand will generally result in a better grip than a factory new knife. The good stuff just gets better with age, right? There’s something about a stacked leather handle. Like that pair of jeans that fits better every time you break them out, you just have to appreciate the things in life that get better with age. I wasn’t sure how I’d feel about the uniformly cut notches that may line up with your fingers. It turns out the notches enhance the grip and provide cooling channels that are handy when performing field work. The length of the handle suits a blade of this length nicely, and the knife feels balanced and capable in hand. When handling the knife you will notice that the 7-inch blade feels surprisingly light and easy to wield. This is the result of two things. First, the blade is just under 1.25 inches wide and is slightly offset when looking at it compared to the handle. The result is a counter effect to the lighter, tapered blade edge versus the heavier spine. While I haven’t come across anything outright from KA-BAR saying this was intentional, I have to believe it is. This offset isn’t built into the smaller 5.25-inch version, but was easily identified on every picture I pulled up while searching full-sized versions online. Second, the balance point between the blade and handle favors the handle somewhat. This makes accomplishing fine tasks more manageable than comparable knives with longer blades. Sheaths are available that generally match your choice of handle material. The version with the stacked leather handle comes with a leather sheath. The leather sheath can come stamped with your chosen branch of service. The KA-BAR logo includes “U.S.A” if you opt out of the military service versions. Plastic sheaths are standard for those that choose the Kraton handled version. For use in saltwater or very humid regions, the plastic/Kraton version is the obvious choice. Both sheaths are well made and pair amiably with the knife from both a functional and aesthetic standpoint. The knives I own both came with leather sheaths. The leather is of high quality and the stitching is excellent. I assume the plastic versions are made to the same high standards. Finding a more historically rich knife that has proven itself times over and is still in production today (at a VERY reasonable price) would be a challenge. The KA-BAR Fighting/Utility line boasts a variety of options that will suit the vast majority of users. I’ll be first in line if they come out with a hybrid between the full-sized 7-inch version and the shorter 5.25-inch one. With all the variety in Ka-Bar’s lineup, I still would prefer the blade to be about an inch shorter. I’m pretty sure I’ll be happy to have their standard 7″ version by my side if I ever do run across that legendary wounded bear in the woods. That extra blade length also comes in handy when using the knife to baton firewood. Quibbles about size aside, the fit and finish of my knife is outstanding, and the construction is clearly built to take a lifetime of punishment. 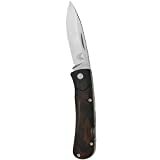 If you are looking for an all-purpose outdoor adventure knife the KA-BAR Fighting Utility knife is one of my top picks in the value category. It’s just a solid all-round knife. Plus, you get to hold in your hand a functional piece of history that helped win World War II and other engagements. I have a couple children to pass this knife on to, and I’ll have to make sure the kid I don’t pass this one down to gets something amazing to compensate. Then again, at this price you can afford to buy one for each kid. I recommend purchasing the KA-BAR Fighting/Utility Knife at Amazon or BladeHQ. Please consider that purchasing anything through any of the links on this website helps support BladeReviews.com, and keeps the site going. As always, any and all support is greatly appreciated. Thank you very much. During the 2016 SHOT Show, I had the great opportunity to meet a man named Ethan. Ethan was working at the KA-BAR Knives display and approached me as I was viewing some of KA-BAR’s newest designs. We began talking about knives and telling war stories, and before I knew it, almost an hour had passed. When I shook his hand to say goodbye, he handed me a nifty little knife to take with me. He also handed me his card, at which point I finally realized that I had been talking with Ethan Becker. Ethan Becker is a household name for many. His grandmother is Irma S. Rombauer, author of one of the United States’ most widely published cookbooks—Joy of Cooking. Ethan assumed authorship of this popular book from his mother in 1976, which is why his name is familiar to so many in the kitchen. As an avid outdoor enthusiast who was in constant search for the perfect knife, Becker founded Becker Knife and Tool in the early 1980’s and began designing and manufacturing hard-use knives right out of his garage. His knives have always been highly regarded among knife experts and critics and in high demand amongst users. To attest to this is the fact that he won the 1990 Blade Award for Most Innovative American-Made Design. While the demand for BK&T Knives has far outgrown Becker’s garage, KA-BAR Knives continues to produce his best-selling designs. The knife that Ethan handed me during SHOT Show was the BK14 EsKabar, a hybrid collaboration between BK&T/KA-BAR and ESEE Knives. This unique little neck knife (which KA-BAR allowed one of its customers to name) features the blade design from the BK&T/KA-BAR Becker Necker and the handle design from the ESEE Izula. Made in the USA from 1095 Cro-Van steel, this seven-inch long lightweight knife, featuring a drop-point blade makes for a highly functional everyday/survival knife. Of course, those familiar with the ESEE Izula will want to know how these two knives compare with each other. To answer that question, the dimensions of the EsKabar and the Izula are identical from the handle, which measure 3.75” long. The EsKabar incorporates the large quillon from the Becker Necker, as well as the larger Necker blade. The blade on the EsKabar measures 3.25” as opposed to the 2.63” blade on the Izula. The EsKabar also has a larger belly than the Izula. The difference in thickness is only 1/100th of an inch with the EsKabar being the thicker knife at 0.165”. For those who may be wondering what the difference is between 1095 and 1095 Cro-Van, 1095CV is essentially the same chemical composition as 1095 with the addition of small amounts of Chromium and Vanadium for better hardening and bonding (hence the term “Cro-Van”) and smaller amounts of Nickel and Moly for added toughness and edge holding. The actual AISI name for this steel is 50-100B. KA-BAR has been using 1095CV for years, even though there was a period where they actually listed it as 1095 in their literature. As I mentioned previously, the EsKabar handle is identical in every way to the ESEE Izula with the exception of the 1/100” difference in thickness. The skeletonized handle has a good feel to it, but gets even better when you wrap the handle with 550 cord. The handle has a nice angle to it, which offers some excellent cutting ergonomics. It is a simple, yet functional design. Editor’s note – you can also purchase OEM scales from ESEE for the EsKabar. I imagine they make the knife feel real similar to my Izula II (excellent). The EsKabar comes with a MOLLE compatible, injection-molded plastic sheath that can be worn around the neck or lashed to gear using the accompanying 550 cord. It is also cut to fit the KA-BAR TDI metal belt clip, which is available from KA-BAR for $10.35. The sheath comes equipped with a safety lock to ensure that you don’t lose your knife when things get rough. This feature can be removed if you prefer a more streamlined setup. Personally, I found that I prefer to carry the EsKabar as a neck knife using a 550 cord lanyard. When wearing a neck knife is too cumbersome or inconvenient, then I simply create a belt loop on the sheath by running a piece of 550 cord vertically through two rivets on the inside of each side of the sheath and crossing the cord on the outside in the same fashion as one would lace up a shoe. This creates a nice belt loop attachment that does not add any extra bulk to the sheath. If you use a cord lock to secure the cord rather than a knot, then you have the added option of a convenient quick release. I also prefer to remove the safety lock from the sheath. It adds some unnecessary bulk to what is otherwise a nicely streamlined system. The knife locks so securely into the sheath that most people will find the presence of the lock unnecessary unless going into the harshest of environments. I was very pleased with the quality and design of the EsKabar. I love to see knife-makers work together on projects such as this one. One of the things that I have always appreciated about the knife industry is that there is such a level of camaraderie and appreciation for each other’s work. Knife makers understand the blood, sweat, and tears that go into transforming a chunk of steel into a functional work of art. The joint effort between BK&T, KA-BAR, and ESEE that resulted in the EsKabar is a testament to the benefits of such companies working together to reach a common goal. If you are looking for an economically priced, fixed-blade survival knife, then you can’t go wrong with the EsKabar. With a retail price of around $60.00, the EsKabar delivers high-end quality and functionality to a price point that most people can afford. I recommend purchasing the BK&T/KA-BAR EsKabar at Amazon or BladeHQ. Please consider that purchasing anything through any of the links on this website helps support BladeReviews.com, and keeps the site going. As always, any and all support is greatly appreciated. Thank you very much. Hootenany, noun, a social gathering or informal concert featuring folk singing, and sometimes, dancing. I don’t read too far into names, but I had to look Hootenanny up in an attempt to gain a little context. If you ever meet Ken Onion, the designer of the Hootenanny, you will quickly learn he is a fun and lighthearted guy. Perhaps the name offers more of a view into the designer himself, than the product at hand. The Hootenanny is Ken’s take on a folding hunting knife crossed with a modern Every Day Carry (EDC) piece. So perhaps the name harks back to old timey days, when people might regularly use their folding knives to prepare meals and whittle sticks around the cracker barrel prior to a good ole fashioned hoe down. Either way, this struck me as one of CRKT’s best offerings of 2015, and I wanted to give it a shot. The Hootenanny has an overall length of 7.84″, a 3.34″ blade, weighs 4.8 ounces, and is made in China. 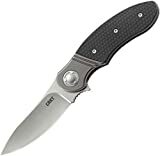 Since partnering up with CRKT, Ken Onion has seemed to favor thinner, lighter knives. I think that is a good thing. The Hootenanny is still a big knife, so any attempts to pare it down to something manageable are welcome in my book. This is a “fish and fowl” knife, so it’s primary application is for hunting and processing small game. Extra length to the blade and handle are important for being effective in that role. With that said, most people who buy this will likely use it as a EDC piece, and that is the main perspective that I evaluated Hootenanny from. The Hootenanny has a slender upswept blade with a long curving belly and high hollow grind. Perhaps the most distinctive feature of the blade is the run of jimping midway along the spine. All of these features were built into the knife with processing meat in mind. I’m not a hunter, and didn’t get a chance to take this one fishing, but I have used it in the kitchen. The knife slices well, and the upswept tip stayed out of the way when I broke down a chicken for dinner. I could see this having a place at a camp site, but did not test the knife in that capacity. CRKT went with 8Cr13MoV steel. I’ve discussed this steel quite a bit (and you can always read further about knife steel on the knife steel page), but for the uninitiated 8Cr13MoV is a lower end Chinese stainless steel. It is easy to sharpen, but not particularly great in the edge retention department. Given the ~$40.00 price point I think the choice of steel is appropriate here. You won’t find much else from a Chinese knife in this price range. I personally do not mind 8Cr13MoV at the right price. I was careless and my blade did develop a little corrosion during testing, so be sure to keep it cleaned and oiled like any other pocket knife. The Hootenanny is a bolstered knife, with a stainless steel frame, FRN (reinforced plastic) handle scales, and a FRN backspacer. The handle has some nice details, with flush mount bolts holding the scales in place, curving lines cut into the gunmental gray bolsters, bolsters that are integrated into the liners, and an oversize decorative pivot. The construction is solid and the finish work is good. The pieces line up, the tolerances are tight, and the end result is a thoughtfully executed handle that makes the most of its humble materials. The Hootenanny is a large folder and provides plenty of room for a variety of grips and hand sizes. The blade has a large foward finger choil, allowing you to move in close on the blade. The handle scales are lightly textured. The scales offer some traction, but aren’t as grippy as peel ply G10. There is jimping on the back of the handle, and also on the spine. All of these features are designed to hold your hand in place; presumably while gutting a trout or plucking bird shot from a dove. I used the knife in more pedestrian applications, and found the Hootenanny to be be comfortable and grippy. Ken knows ergonomics and that shows in the design and execution of the Hootenanny. In the past, Ken Onion’s pocket clip designs have been criticized for being goofy. The clip on the Hootenanny is relatively subdued and discrete. It curves along the back side of the handle, and is really set for right side tip up carry only. Being a lefty, I prefer an ambidextrous option, but if you are only going to put the clip in one spot, this is the place to do it. The clip has good spring retention, and it buries the knife deeply in the pocket. In practice the Hootenanny caries well for a larger knife. At nearly 5 ounces, you feel this knife in the pocket – especially with most of the mass being around the pivot. Still, the Hootenanny is a comfortable carry. The knife is thin and the pocket clip is strong, so you can clip the knife in place and then forget about it. Like many of Ken’s designs, the Hootenanny is a flipper. The flipper is prominent, heavily textured, and easy to locate and flip. The detent is strong and the blade fires out with a loud metallic “thwack”. CRKT has done a good job with flippers in the past, and this Hootenanny is no exception. Inside there are what appears to be caged bearings, although CRKT has marketed this as an IKBS (Ikoma Korth Bearing System) knife. The action is smooth and the blade glides into the open or closed position. CRKT and Ken decided to make the Hootenanny a bolster lock knife, which is basically a frame lock where scales run 3/4 the length of the handle. The bolsters are 2CR13 steel, and hold the blade securely in place. There is no lock rock or side to side blade play in my knife, which is what I would expect from a steel frame lock. My knife locks up around 70% – so it’s a later lockup, but it has stayed there since day one and there is no stickiness to the lock at all. My blade favors the lock side by a millimeter, but does not rub. The Hootenanny is a successful knife, and is probably my favorite CRKT design for 2015. This is a more subdued design for Ken. There is no recurve in the blade, the pocket clip is normal looking, the overall look is handsome with the dark scales and gunmetal gray bolsters. The fit and finish of CRKT’s stuff has always been nice, and the Hootenanny is no exception. And I think given the budget CRKT made some nice choices here with the satin finished blade, IKBS, strong flipper and oversize pivot. The use of FRN keeps the knife reasonably light (that is a big reason why I decided to not review the CRKT G.S.D. – a handsome knife by a popular designer, but just too heavy for my taste). If I had to complain, I would complain about the knife begging for higher end materials. Better blade steel would be at the top of my list. People harped on Cold Steel for years about their use of AUS-8, and now that everything is being rolled out in CTS-XHP, I think we need a new company to “encourage”. And CRKT is actually heading in that direction. They have collaborated with LionSteel, TOPS, and Condor to venture in to higher end products like the Hi Jinx, Hoodwork, and Mah-Chete. While CRKT is a company whose bread and butter is value and volume, the enthusiast in me can’t help but ask for a higher end version of the Hootenanny. For around $40, the Hootenanny delivers a lot of bang for your buck. If you are in the market for a sturdy 3.5″ folder, you will be hard pressed to find much better at this price point. Perhaps the Kershaw Blur is the closest competitor, but these days they retail for well over $50. The Hootenanny is a thoughtfully designed and well made tool, that works as either a folding field knife or large EDC. I recommend purchasing the CRKT Hootenanny at Amazon or BladeHQ. Please consider that purchasing anything through any of the links on this website helps support BladeReviews.com, and keeps the site going. As always, any and all support is greatly appreciated. Thank you very much. Benchmade’s Hunt series (or “Munt”, depending on how you interpret their packaging), is a series of outdoor inspired hunter focused knives. I have never been a hunter, so my first impulse was to ignore the Hunt series. But a deeper dive into the line left me curious about a couple of their knives. The Small Summit Lake had me intrigued, especially given my somewhat newfound interest in traditional knives. And especially in the wake of the success of the Boker Urban Trapper, which masterfully blends old timey pocket knife charisma with titanium, bearings, and stainless steel. The Small Summit Lake is less of a mashup, but it takes things people appreciate about knives like the Buck 110, classic lines, rugged build quality, and a practical, time-proven design, and mate those qualities to 21st century manufacturing methods, high end steel, synthetic materials, and creature comforts like pocket clips and torx bolts instead of pinned construction. That combined with an EDC friendly footprint and reasonable price drew me to the Small Summit Lake. The Small Summit Lake has an overall length of 6.89″, a 2.89″ blade, weighs 3.04 ounces, and is made in the USA. Blade thickness is almost 3mm and this knife has full stainless steel liners, so it’s not the absolute lightest knife on the market, but it’s still certainly small enough for daily carry. The Small Summit Lake has a substantial feel to it. That makes sense, given how the Small Summit Lake is marketed as a hunting knife. The Small Summit Lake features a modified drop point blade with a high flat grind. The edge of the knife rides along a near continuous belly. The tip is fine and pointy, but it is not delicate. The blade has been given an attractive two-tone satin finish. Benchmade decided in CPM-S30V for the blade steel. I have had great success with Benchmade’s S30V in the past. Most notably, I have enjoyed the S30V in my Benchmade Volli. That knife continues to impress me, even though it has flown under the radar for most. At any rate, while I would prefer to see Benchmade upgrade all of their CPM-S30V knives to S35VN, I found that the S30V on this knife performed well. It’s reasonable to sharpen, holds a nice edge, and is resistant to corrosion. In short, it’s good stuff. The blade is ground from thick stock. The thick stock combined with a narrow blade, and high flat grind all lend to a stouter geometry. This results in a stronger blade that doesn’t slice as well as something like a traditional slip joint. But the Small Summit Lake still slices, and it cuts well considering. I am guessing that the blade will also hold up a little better under the rigors of hunting and camping than a thinner ground knife. The Small Summit Lake’s handle scales are made of DymondWood. DymondWood is a resin-impregnated hardwood veneer designed to be used in place of real wood manufactured by Rutland Plywood Corporation. The pro to DymondWood is that you have a product that looks a lot like wood, so it should be tougher than natural wood. The con is that it’s not real wood, so you lose a little of that character and depth that only real wood provides. I like the DymondWood scales and think the material works nicely on this knife. Underneath the DymondWood handle scales you have full steel liners. I suspect they did not skeletonize these liners to make cleaning easier. A wise choice if you are going to be using the knife to skin a deer. The backspacker and lock bar are all stainless steel and the handle is held together with 3 torx bolts and a pivot bolt. Fit and finish is excellent. In hand the Small Summit Lake performs like an upgraded traditional slip joint. There is a generous amount of jimping on the spine and handle. The jimping runs a fine line between provided adequate traction without tearing up your hand. There is a further run of jimping on the spine of the blade towards the tip. This is supposed to aid hunters in skinning and breaking down carcasses – can’t say I have used this feature much. The handle itself is simple , inoffensive, and allows for a comfortable 4-finger grip. The DymondWood isn’t a high traction material, but it isn’t slippery either. For my purposes the Small Summit Lake has great ergonomics. A nice surprise with the Small Summit Lake is that it comes with a deep carry pocket clip. This is something you don’t see on a traditional knife, and it’s a welcomed addition in my book. The handle has only been tapped for right side tip up carry. I would prefer an ambidextrous mounting option, making the entire knife (more or less) fully ambidextrous. The knife carries deeply and discretely in your pocket. With a weight of 3.04 ounces and a closed length of 3.65″, I did not notice the Small Summit Lake as I carried it around. The clip all but completely buries the knife. And traditionalists could always take off the clip and let the knife ride free in the pocket or in a leather slip sheath if they wanted to. The Small Summit Lake comes equipped with a single (right side) nail nick. No thumb studs, flipper, or thumb hole on this knife. I don’t have a problem with this. The knife looks clean with the traditional nail nick, and the blade is easy to open with either hand. Inside Benchmade included phosphor bronze washes – another welcome modern touch. There is also an adjustable pivot which is great for on the fly tweaks, or a full take down. If you disengage the lock the blade swings freely, and there is even a little “half stop” milled into the tang of the blade. This is not something I have seen on a lock back before, but I like half stops, and I enjoy it here. For lockup you have a traditional lock back. This tried and true design has worked for decades, and it continues to work with great success here on the Small Summit Lake. The lock is sturdy, popping in the blade in place with a satisfying “snap”, and it disengages with relative ease. Lock up is secure and as you would expect from a lockback with full steel liners. There is no side to side or up and down play in my knife. While it probably isn’t on par with a Tri-Ad lock, this is still a strong lock. Blade centering is good on my knife, and favors the show side by a hair. This is a surprisingly good knife from Benchmade, and I think it would be a mistake to gloss over the Small Summit Lake, even if you aren’t a hunter. The knife does a great job blending traditional with technical, and is a modern twist on a classic folding knife. And the price is reasonable too – at a little over $100, the Small Summit Lake isn’t cheap, but it isn’t a bank buster either. I enjoy the addition of jimping, CPM-S30V blade steel, phosphor bronze washers, and pocket clip. These modern conveniences elevate this classic pattern, and I find little to fault with the Small Summit Lake. It would be great if Benchmade made this one fully ambidextrous. That would be nice. I also would be curious to see Benchmade take this concept, slim it down, and offer a full on gent’s folder. It may not belong on the game trail at that point, but a refined and updated traditional folder from Benchmade could give something like the Indian River Jack a run for its money. I think the Small Summit Lake could be a great choice for someone wanting an updated traditional folder, or a modern lock back with some traditional charm. This knife straddles a couple genres with surprising grace. The Small Summit Lake is just as at home by a camp fire as it is at a pocket dump on Instagram. For that reason it has earned my recommendation. 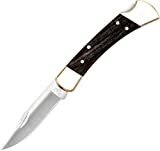 I recommend buying the Benchmade Small Summit Lake at Amazon or BladeHQ. Please consider that purchasing anything through any of the links on this website helps support BladeReviews.com, and keeps the site going. As always, any and all support is greatly appreciated. Thank you very much. With the weather turning cooler, it was high time to get outside and to start tearing into the yard. We had an especially hot and wet summer this year, and the back 40 was taking over the entire house. I wanted to try out something new to tame the jungle, and settled on the Becker BK-9. After acquiring a BK-2 a year ago, I wanted to explore the Ka-Bar / Becker line further. I favor choppers, and quickly landed on their iconic BK-9. This is a popular knife for Ka-Bar, and for good reason. Designed by Ethan Becker, made in the USA with a 9″ 1095 blade, full tang, and sub $100 price tag, the BK-9 is a lot of knife for the money. It’s a staple in Becker’s lineup and I have waited too long to acquire one. I was curious to see how it would stack up to my trusty Junglas, and also test the knife in its own right. The BK-9 has an overall length of 14-3/4″, a 9″ blade, weighs 16.8 ounces (~1lb), and is made in the USA. This is a hefty knife that borders on short sword territory. Your needs from an large outdoor fixed blade will drive whether this is a camp knife, “survival” knife, combat knife, or back yard tool. For me, this has mostly been a back yard tool. There are some invasive ficus trees in our back yard, and despite judicious pruning they continue to grow like weeds. I have used my BK-9 multiple times for limbing, chopping, and preparing wood for camp fires. Those experiences have informed the majority of my opinions on the BK-9. Dubbed the Combat Bowie, the BK-9 features a long clip point blade. The clip point is no joke. Towards the end of an especially vigorous chopping session, I somehow managed to poke myself in the inner thigh with the tip of the BK-9. The blade only sunk a eighth of an inch, but it opened my leg efficiently, and sent a small stream of blood down my calf. I would not want to be on the business end of this thing. I recommend that you exercise extreme caution in use, as this knife strikes me as a more dangerous than your typical camp knife thanks to the fine tip. The blade is 3/16″ thick, and has a high flat grind with black powdercoat (although a premium clear-coated version is also available). The powdercoat is thick, and protects the knife from rust. It slowly wears down with use. This knife is not the best slicer, and those hoping to use it to prepare dinner are likely to be disappointed with the performance (it is really too unwieldy for those kinds of jobs anyways). The BK-9 is more at home buried in a tree limb, and it does an admirable job chopping and batoning. Compared to my larger Junglas, I wish it had a little more heft for chopping, but the BK-9 still performs well and it is a lighter package. The BK-9 comes in 1095 high carbon tool steel. I have written dozens of articles on fixed blade knives in 1095, including reviews of a lot of the ESEE lineup, and of Becker’s own BK-2. So I’m no stranger to the steel. I have come to appreciate its hearty nature. 1095 is ideal for processing wood. It is tough (although it will still chip if you strike a rock with it), and holds a good edge against wood. It is less ideal if you are breaking down boxes, cutting yards of rope, or dealing with other abrasive materials. In those situations, I prefer a good stainless or semi-stainless. Plus 1095 is cheap, and it helps keep the cost down. I’d love a knife like this in 3V, but I wouldn’t want to pay $300 for it. So 1095 strikes a sweet spot for a number of reasons. I oil my BK-9 down after each use with a little WD-40, and store it in the garage. I haven’t had issues with rust on the blade. A couple of the bolts on the handle have developed a little rust, so don’t make the same mistake I did, and be sure to oil those as well. The BK-9 shares the same handle of the entire Becker line up. This is a proven handle design and is a smart idea. The standard handle material is Ultramid, a high density plastic that has likely been glass reinforced. Micarta scales are also available and this is a popular knife for customization. The Ultramid is tough and attractive with its smooth matte black finish. It’s not the most exotic material in the world, but it’s inexpensive and is well executed here. The scales bolt on to the handle so you can disassemble it for cleaning or to swap on some aftermarket scales. Fit and finish is good. The pieces line up well, and there are no sharp edges to speak of (save the cutting edge). Ergonomics are everything on a tool like this. A poorly designed handle on a chopper is a recipe for blisters and discomfort. Ethan Becker has given the handle a lot of consideration, and it shows. This is a comfortable handle. After extensive use I did not notice any hot spots, and my hands were blister free. I will say that the Ultramid does not offer a ton of texture, and prefer micarta because of the nice grip it provides – even when wet with sweat. While the plastic handled BK-9 never flew out of my hand, I still prefer micarta. The BK-9 comes with a black nylon sheath with a molded kydex insert. I think the sheath is well executed. It’s lightweight, durable, and has thoughtful touches like a belt loop that doesn’t require you to take your belt off to use, and there is a little velcro under the retention strap to hold the strap out of the way of the blade as you draw the knife. These kinds of details are often absent on less expensive nylon sheathes. Also, the materials used is of a higher quality. I am not an expert on fabric, but when you compare this with the sheath of the Schrade SCHF9, the difference is immediately apparent. Everything is tighter and of higher quality. There is also an external pouch with a second kydex insert for a small fixed blade, and a pocket for a whetstone (or some other smaller piece of gear). The sheath is fully ambidextrous. The kydex insert does not hold the blade in place with friction alone, but if you engage the snap closure the knife is held securely in place. While there is a lot to like about the BK-9 sheath, I much prefer the sweet kydex sheath found on my Junglas. Sure, the Junglas is significantly more expensive, but the sheath on that knife is beyond compare. The knife makes such an awesome “thwack!” every time you sheath the blade – it is arguably the most satisfying “knife experience” in my entire collection. In conclusion, I think the BK-9 sheath is nice, especially given the price and when compared with other fabric sheathes, but it still leaves me pining for kydex. Apparently Ka-Bar is attempting to scratch that itch and has a kydex style sheath for the BK-9 listed for sale on their website. It’s offered for $50.00. There are plenty of after market sheathes also available. The BK-9 is another workhorse in the Becker lineup. It strikes that delicate balance between quality, utility, and price. For under $100 you get a substantial and well made knife. The design, materials, fit, and finish are all on point. The sheath is great for a nylon sheath. Ethan Becker has massaged this design thoroughly, and has squeezed out every ounce of performance that he could given the knife’s size and budgetary constraints. Also, the BK-9 is made in the USA. This always brings a twinkle to my eye. That said, for my money I would pay the premium for the ESEE Junglas. The Junglas is just a little bigger and a little badder in every way. I think it’s worth the extra dough. If you buy a BK-9 and then upgrade the scales and sheath, it will cost you as much as a Junglas anyway. However, none of this is said to make light of the BK-9. It is still an excellent knife in it’s own right, and it has developed a loyal following. But I am a huge Junglas fan boy and I know that the “Junglas vs. BK-9” battle has come up many times before. This is simply my opinion. If you want a tough chopper and are looking to keep things under $100 you can’t go wrong with the Becker BK-9. It gets a lot of things right and it won’t be leaving my collection any time soon. If you would like to buy a Becker BK-9, I recommend buying it at Amazon or BladeHQ. Please consider that buying anything through any of the links on this website helps support BladeReviews.com, and keeps the site going. As always, any and all support is greatly appreciated. Thank you very much.